« Yarn Shop Day – This Saturday! What a fantastic post! Such an interesting insight into your creative process, and the shawl is beautiful! It’s a really good issue this time round isn’t it? 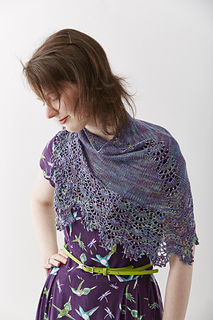 I love the other designs in the Arts and Crafts collection, especially Karina Westermann’s shawl – now I just need a time machine so I can make them all! The shawl is gorgeous and it’s fascinating to see what goes on from idea to final result. Thank you 🙂 the funny thing is, I never think about the creative process itself at the time. Deadlines make you very focused on just getting it finished in time, so it’s only afterwards that you think about it. Love it! Thanks so much for showing us the other side as well; as a colour work addict, am always curious to see the stranding too! Really gorgeous, Lottie. I think I must go buy Knit Now! Well done – I think you’ve captured the Morris “vibe” perfectly. And I’m most impressed by the wrong side looking as if it’s another right side in a different kind of stitch or pattern. Thanks Christine, I was very fussy about making sure I was consistent with my floats so that it looked just as neat on the wrong side! It was certainly a very rewarding design process, but a lot of knitting to do in a very short space of time (I’d recommend anyone else allows much more time so that they can enjoy the process a bit more! ).